***NEW this year, we will offer vendor booths for your holiday shopping needs! Let’s cook pasta and veggies! Learn about the grain gropu and making healthy food choices. This program is geared for 4th grade and up but younger children welcome with an adult. 4:00 – 7:00 pm – Wine Wednesday, $5 a glass, at Capital Cellars, 227 W Broadway. Info: 352-2600. Join us for the last Wine’d Down Wednesday of the season with Chris Fallis. We offer drink specials, free live music, and an awesome space to hang with friends! 8:30 – 11:30 pm – Open Mic, $2.75 import and craft beer, at the Brick Alley, 325 St. Clair. 875-2559. Pint Night* When you buy the featured pint, you get to keep the brewer’s pint glass *limited supplies at Bourbon on Main, 103 W Main St. Info: 352-2720. 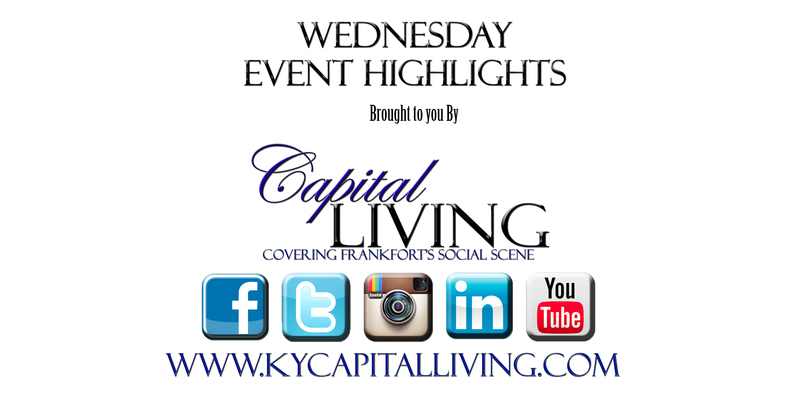 Capital Living Covers Frankfort’s Social Scene…Be Seen by Capital Living!